Another practical hour with Fr. Nick and Presbytera (Dr.) Roxanne Louh addressing the issue of addiction. Fr. 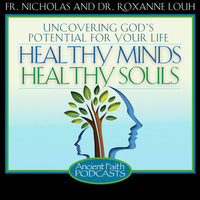 Nick and Dr. Roxanne are joined by Ancient Faith author and podcaster Rita Madden. Rita is the author of the book Food, Faith, and Fasting and offers some practical wisdom as we begin the Nativity fast.